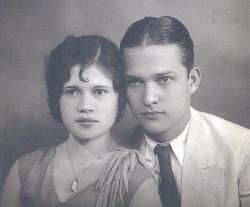 Born on 7-Jul-1907 to William Henry GARDNER, a Manila Police Officer, and Ceferina De Castro in Sampaloc, Manila, Philippines. His father, an American soldier from Tennessee, arrived in the Philippines in 1899 to fight in the Philippine Insurrection and began serving as a policeman under the American administration in 1901. Marvin Edward was the eldest surviving child with four sisters and one brother (see William Henry GARDNER Family Group Record). 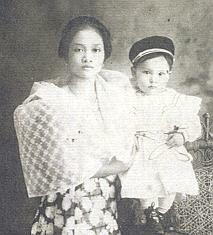 My parents made their home in Manila and reared a family of eight. Two died in infancy, leaving two boys and four girls. Marvin was the oldest boy and George, the youngest. The girls were Dolores, Trinidad, Cora and I (Flora). We lived at the back of the police station. Papa was assistant to the captain and was on 24-hour call. The jail was on the front side of the police station. We always felt safe and well cared for since we were so close to where Papa and the policemen worked. After Papa died of a heart attack on March 12, 1929, our family had to move out of the police precinct. I was a pre-teen and still not aware of the many problems of life without our father. Marvin was away at sea working on a freighter that sailed for America. Marvin joined a movie company and became an actor (early 1930's). 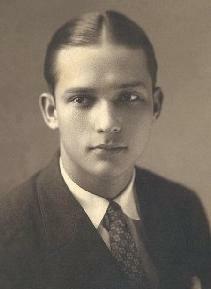 He was so handsome that he became known as the "Rudolf Valentino of the Philippines." 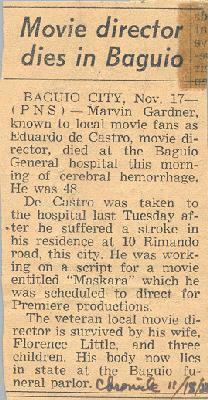 His professional name was Eduardo de Castro (after Mama's maiden name). She was so proud of him and would point out to us his name on banners and billboards announcing his movies. He later became a director. His career flourished and he married his leading lady (Florence Little). What a good looking pair they were! Later he became father of two handsome boys. The war changed all our lives (1942-1945). Although Manila was declared an "open city," it was continually bombed. Manila Bay was a graveyard of sunken ships. George, who was then a teenager, joined my brother Marvin with the guerillas in the hills. George evaded arrest and returned home just before liberation, but Marvin was caught and imprisoned in the infamous Fort Santiago in Manila's walled city (Intramuros). When he was released, we could not recognize him with his beard and unkempt rags hanging from his emaciated body. He looked like a walking skeleton but thank God he was alive. Just a short message being mailed to you by a friend to notify you of the death of my oldest brother, Marvin. I last wrote to you on Nov. 16th and mentioned him particularly. Little did I realize then that he was dying just as I was writing you about him. He is at last at peace. The last few years were very unhappy and confused years for him. He drank heavily and consequently failed to get pictures to direct. At one time, he was the highest paid movie director in Philippine movies. But he died destitute. I took care of all his hospital and burial expenses. His son, William, was a great help to me. His first wife, Florence, did all she could. But his second wife, Norma Krueger, had left him 3 years ago and never attended the funeral. She left her 2 children, a 4-yr. old girl and a 3-yr. old boy, with her mother, who has been caring for them. Since these are Marvin's legal children, I feel responsible for them. P.S. Marvin had 2 sons by Florence, both married with families. The oldest son is in Korea. William, the younger son, is studying here on the G.I. Bill of Rights (finishing accounting in 1956). Three of his movies, one as actor, two director are listed on the Internet Movie Database (IMDb) website. The movie, "Zamboanga" (1938), which he directed, is considered one of the oldest extant Philippine films and was recently repatriated to the Philippines after being discovered by film scholar and director, Nick Deocampo, at the U.S. Library of Congress film archive.